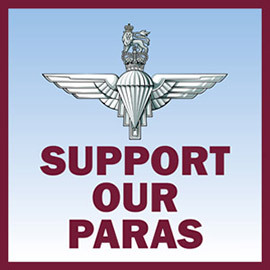 The Airborne Shop is the trading name of ABP Retail Ltd.
We do not collect or store any of your personal information if you do not register with us or place an order, unless you sign up to receive marketing from us separately. Allow you to recall previous orders and use your saved personal information when making an order (to speed things up for you!). Payment processors (Sage Pay / PayPal) - Your information is shared to enable these companies to process your payment securely and for fraud prevention reasons. Your information is only shared with with these companies if you choose to use their service to pay for your order. Delivery companies - If you order includes physical items, your address information is shared with our delivery partners to enable us to deliver your order. Reviews.co.uk (https://www.reviews.co.uk) - We provide your name, email address and details of your purchase to our reviews partner once you place an order with us. They will then send you an email to ask if you would like to review our service and products. Please see the marketing section for information on who we share your information with if you choose to receive additional marketing from us. We will not share your personal information with any other external companies without your additional, prior consent. If you believe that any information that we hold about you is incorrect, please contact us and, where appropriate, we will work with you to correct the information. You also have the right to request that we destroy all of the information that we hold about you (your “right to be forgotten”). Again, please contact us if you’d like to us to do this and we’ll be happy to oblige. Cookies are small data files that allow a website to collect and store a range of data on your desktop computer, laptop or mobile device. Cookies help us to provide important features and functionality on our website. For further information about cookies, please visit http://www.aboutcookies.org.uk. You can set your browser not to accept cookies, and the above website includes instructions of how to remove cookies from your browser. Please note that setting your browser not to accept cookies, or removing cookies whilst shopping with us, will negatively affect your shopping experience (for example, not allowing you to add items to your shopping basket). You’ll always be sent an email to re-confirm that you’d like to receive our marketing emails before we send you any. You can also unsubscribe from these emails at any time if you change your mind. We use a company called MailChimp (https://mailchimp.com/legal/privacy/) to send marketing emails and to manage our mailing list.